Can you imagine not needing a leash anymore? It’s possible! Who is The Dog’s Way Advanced Off-Leash Program for? The Dog’s Way Advanced Off-Leash Program is for people who spend time with their dogs in more adventurous areas. 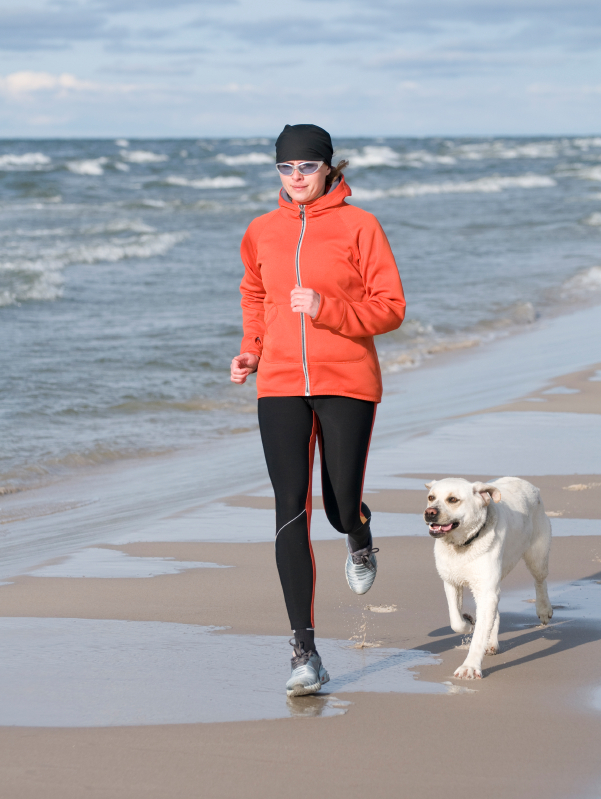 If you hike, run on the beach, or enjoy time on a large property with your dog, having reliable, rock solid, off-leash obedience makes that time infinitely more enjoyable and stress free. Our Advanced Off-Leash Program is for people who also just. want the ‘peace of mind’ that they no longer need a leash around to control their dog in high distraction situations. If an unforeseen, emergency, situation arises, it’s comforting to know that your dog will listen even when they are hundreds of feet away from you or that they will come back every time that you call them. However, the Advanced Off-Leash Program is only for people who have graduated from the Basic On-Leash Course. Bummer!? I know! There’s some ground work that we have to do before moving on to the fancy stuff.  If you’ve read, seen or heard, any of my training, you know that the main principle I follow is the “natural learning process” – that is, always start easy and then incrementally adapt to progressive challenge. By the time you’re through with the Advanced Off-Leash Program, your dog will listen to you and perform obedience commands from a hundred feet away in high distraction, recall every time, and be able to be sent into something (like your truck or car) from a great distance. This kind of competence isn’t an entry level set of skills. To be fair to your dog (and you), I want your dog to have the foundational competency of the Basic On-Leash Program before moving on to advanced work. You get specific homework assignments each week and there is a lot of homework with this course. Plan on devoting a lot of time, during the 5 weeks of course, to laying the foundation that will last for the rest of your dog’s life. Will I need any special training equipment for this course? slowly get your dog used to a remote training collar. What is a remote training collar? These collars, sometimes referred to as e-collars, are the same type of collar you see on dogs that have an invisible fence in their yard. These fences register an electrical signal from a wire in the ground and give your dog a “beep” warning, and then if they don’t respond to the alert beep, a little static shock (you’ve probably experienced the same sort of static shock if you’ve ever shaken hands with someone in a dry office). A “remote” training collar works exactly the same way, but it allows you to hold a “remote” in your hand and communicate with your dog purposefully as opposed to it being set off when they simply wander near a boundary wire. There is always some reticence with this type of training collar (and frankly, there should be). I’ve always said that a remote training collar is a very efficient tool … you can efficiently train your dog with one or (if you don’t know what you’re doing) you can efficiently mess your dog up! We go through a careful step by step process to transition and expand all the understanding and work you’ve done in the basic course. This allows you and your dog to incrementally adapt to the greater challenges of off leash distance work and the use of these new tools. The program covers all the obedience commands from the basic course but, obviously at greater distance under higher distraction. However, there is a special focus on: recall, sending a dog to a place from distance, down at distance, and leave it at distance. If I haven’t completed basic obedience with you, can I challenge the competency to get into the advanced course immediately? You dog can walk in a controlled walk on your left side (for an indefinite distance past distraction objects that are within reach and ignore them). The assessment: If you think your dog can test out of the basic on-leash program, send me a video of your dog doing most of these things and then we can talk (please don’t film 10 minutes of your dog in a down – I’ll trust that you do a shorter down, with multiple distractions, for the purposes of the video… but, we will do a 10 minute down in the in-person assessment). I’ll arrange to meet and assess your dog’s competence if the video looks promising. The assessment fee is $125.00 and will last 45 minutes. If you’re accepted into the Advanced Off-Leash Program we’ll credit 50% of the assessment fee to the Advanced Program cost.